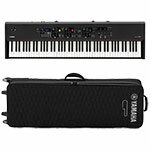 Yamaha CP88 Stage piano and case bundle is the complete performance and transport package for the gigging musician. Finance available. The Yamaha CP88 is designed for the live musician; It offers a lightweight, compact style stage piano with the pinnacle of Yamaha sound technology including the renowned CFX and new Bosendorfer Imperial Grand piano. A design refresh means there are now 3 independent sound sections you can layer or split each with their own sub categories. The keyboard consists of Yamaha&apos;s flagship natural wood graded hammer action for an authentic piano playing experience anywhere you go, and combined with brand new layout, plentiful with hands-on live controls and the capability to play audio direct through the CP88 with a compatible iOS device, this is a true all in one instrument for the player wanting to take studio quality sound out on the road. The CP88 piano excels in its offering of sound choice. It covers everything from acoustic to electric and contains some of the most renowned piano sounds from around the world including the Yamaha CFX grand piano and the more recent addition of the Bosendorfer Imperial Grand. Adding to that is a new U1 upright piano, the Yamaha SU7 and a wealth of electric pianos such as the CP80, 76 RD, 75 RD and more. There is an arsenal of other essential sounds to choose from built in to the &apos;Sub&apos; category of the CP88. Lush pads and strings, deep basses, synth leads, brass and more are all available to choose from and all top class quality. It is easy to layer or split sounds as you need for live performance and create exactly the sound you need on stage. The first update is avalable at launch and update contains a new vintage and modern 1967 tine electric piano, a new reed electric piano and a classic Yamaha C7 grand piano. A new layout design really makes things far easier for use on stage. There are now 3 sound categories - Piano, E,Piano and Sub, all with their own controls such as split, octave and independent on/off switches. Each category has simple sub categories where all the individual sounds are located. Each of these 3 main sound sections can be split or layered so you can create some incredible sounds perfect for your needs on stage. All the main controls and essential buttons are instantly accessible in each section so you can see exactly whats going on all the time. An easy to view LCD display can show additional parameters such as split positions and currently selected voices for ease especially on stage whilst performing. Every sound you create or need for your performance can be stored directly into the CP88 and recalled via the Live Set feature. Live set allows you to choose what sounds you need for you gig/ performance and organise them in an easy to use order in one place ready for instant recall. Each page of a live set can contain 8 instant sound choices of your liking and there are a total of 20 pages available. Dedicated buttons allow you to recall pages and choose a memory 1-8 instantly at the tap of a button. 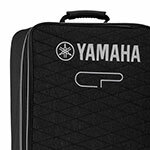 Furthermore the sounds will change glitch and error free using Yamaha&apos;s acclaimed SSS (Smooth Sound Switching) technology. 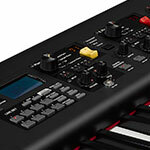 Live sets can also be changed via MIDI if needed with MSB/LSB/PRG commands or even switched via a connected foot switch for hands-free sound control. 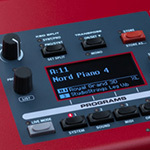 Each category of the CP88 has its own dedicated insert effects system. A simple tap of the effects on/ off buttons in each category will bring to life easily controllable effects. As a final booster, the sum of the tone generation then goes through two System Effects (Delay, Reverb), and a Master EQ.